Solomon Warriors were winners in both clubs league meetings, 1 nil in the first round and 2 nil in the second round, so expections did way in their favour a little bit. Marist Fire did not have the firepower enjoyed by their opponents but were still capable of upsetting Solomon Warriors. The match kicked off to a frantic pace and the toll showed quickly when a clash between 2 opposing players resulted in medical treatment for both and the eventual replacement for one. However, neither side had anything serious to threaten the other with as time went past 15 minutes. Solomon Warriors took control of proceedings as the game proceeded but could not convert until the 32nd minute when Carrol Kakate scored from an Alick Maemae setup. They had further chances to put increase their lead but they were not converted. Marist Fire did not have much control of ball and they had only moments of flare but the Solomon Warriors backline was too much too to deal with. As the halftime break got underway the heavens opened up to make the pitch almost unplayable. An assessment had to be done before the game was allowed to continue but it was going to be a tough ask of both teams to play the same way they did in the first half. Play in the second half was a difficult affair but it did little to slow down the pace of the game. Despite the rain Solomon Warriors were still able of stringing together one-two passes and they looked more dangerous as the second half went on. Mamula striker, Dennis Ifuanoa, gave Solomon Warriors they buffer they were looking for in the 52nd minute and he made it look easy tapping after a cross from his left. With 6 minute left on the clock the game was truly taken out of reach of Marist Fire when substitute Casper Aengari struck taking the score line to 3 nil. 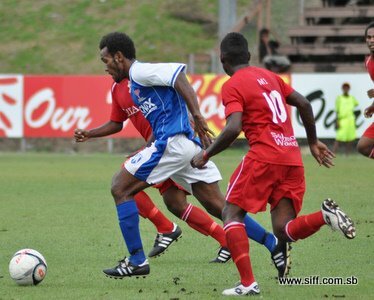 It was a difficult afternoon for Marist Fire who struggled to match their opponents in the attacking department but they still have some chance of getting into the semis if they can turn the result from their second leg their way and score often enough to cancel any away goal advantage that Solomon Warriors have already built up. Solomon Warriors simply had too much to offer both in their starting line up and their players on the bench. The absence of George Lui and James Naka who were both suspended for exiting the league, seemed to matter little to remaining guard.